Is Network Marketing Really a Relationship Business? Is network marketing really a relationship business? This is a question I have asked myself what seems like a million times now. I want to take a few minutes in this post and share my own thoughts on the subject. My immediate answer to the question is yes and no. What I really believe is that our industry is a marketing and promotion business UNTIL you sponsor someone. After that it becomes a relationship business. What I’ve found from personal experience in this industry is that there are two types of people who do really well in our industry. The first type of person is the person who already has tons of strong relationships. This is someone that I call a “connector” or a “person of influence.” They are liked, trusted and respected by the people in their sphere of influence. When they talk, people listen. They have credibility. Let me take a moment and put this in perspective. Let’s assume a doctor joins a network marketing company as a distributor. She invites over a bunch of her friends and family members to her launch party about making some extra money, getting healthy, and starting their own business. What do you think would happen when she did this? People would show up! People would come to her party because they trust, respect and like the doctor, and think highly of her. They wouldn’t nit pick her or give her a hard time. Simply put, she has credibility. This credibility and established network allow her to get off to a fast start and build it big. On the other hand, let’s suppose a person is broke and unemployed. They join the same network marketing company and decide to host their own launch party. They invite over a bunch of friends and family to learn about starting a business, getting healthy, and making some extra money. What do you think would happen? Most people would NOT show up! Why? Because she doesn’t have the same level of credibility as the doctor did. People don’t “respect” her when it comes to business or making money. Once again, people who have ALREADY built a large network of close relationships and are trusted, respected, and liked, have a huge advantage over someone who doesn’t have that going for them. Does that make sense? And think about it this way for a minute. If someone you really liked, admired and trusted invited you to take a look at a way to make some extra money would YOU listen? What if your broke cousin, Will, who has been in ten of those ‘things’ invited you to do the same thing? Would you listen to him, or brush him off? This proves the importance of credibility. The second type of person who does really good in this business model is someone with great sales, marketing and promotional skills. The person who knows how to generate leads, prospects strangers, sell, close people, etc. can build up a large network pretty quickly. They have a huge advantage over someone else who does not have these skills and personality traits. 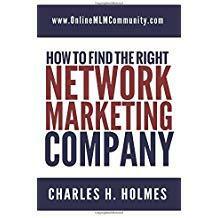 No, network marketing is not like traditional selling where you pressure or convince people to buy or join. But you do have to find creative ways to prospect people, find leads, show the plan, and sign them up. If you are overly shy, lack confidence, or don’t feel comfortable doing this, it will be difficult for you to succeed. Yes, you can learn and develop these skills, but for most people that will take at least a few years to do, especially if they’ve never done it before! If you already have these skills, you can get off to a quick start in your network marketing business and potentially build it big. Now, when it comes to building a sustainable, long-term network marketing business, I believe that’s where relationships are vital. These relationships are the glue that keeps the organization rock solid and together. Look at any successful distributor in our industry who has built and maintained a large group for 20 or more years and you will see a network with tons of rock solid relationships. What’s the moral of the story? First off, look for people with credibility, influence and a large sphere of influence that you can recruit onto your team. Second, look for people with good sales and marketing skills to recruit onto your team. Both types of people are great prospects. Finally, focus on building relationships with the key people on your team. Show them that you are a genuine person and that you care about them. It will make a huge difference. After all, it’s hard to quit on a friend! What are your thoughts about relationships in network marketing? Leave a comment below to let me know what you think. I look forward to hearing from you. Interesting way of putting it Chuck. I was prone to believe yes immediately, but I do see where you are coming from. The value of relationship building is that it really gives you a level or credibility that helps people commit to you, either as a customer or a team member. I can say that college really taught me the power and value of relationship building and helped me to learn to step out of my comfort zone when it comes to talking to and engaging with others. It has been such a benefit to me. You seemed to have put this in a good perspective Chuck. I had never really thought of the relationship side of the business in the way you put it here. I believe that no matter our position in life, we have something to offer other people. We need to learn what we have to offer and leverage it to draw attention to our network marketing business. In some cases, I believe it does mean building relationships through networking with other like-minded individuals. I think we can build relationships with others that are not on our team, but we need to work on our relationships with our teammates the most.